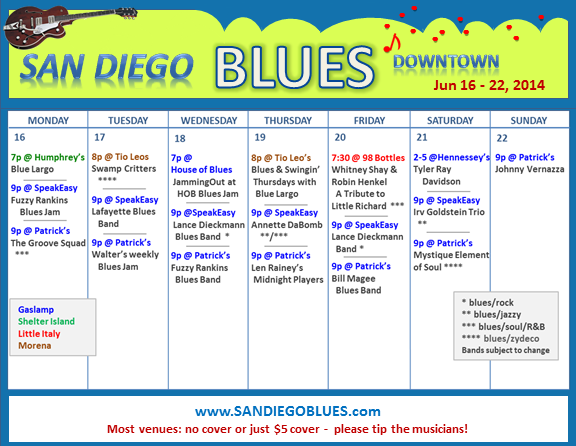 I’m happy to say that Patrick’s Pub in the Gaslamp has a full week of San Diego blues, and most of it straight up blues. Unfortunately I’m not in town to enjoy it, although I did go to a great bl…ues gig last night in Newburyport, Massachusetts hosted by Parker Wheeler with his friends (this week it was SuperChief Trio). There are a few highlights this week to check out… Whitney Shay and Robin Henkel will be at 98 Bottles doing a tribute to Little Richard, and Tyler Ray Davidson (a super talented young guitarist who often plays at the Youth Blues Jam) will have his own blues band performing at Hennessey’s on Saturday afternoon. I’m sorry to miss both of these, so I hope you get to catch one of them. 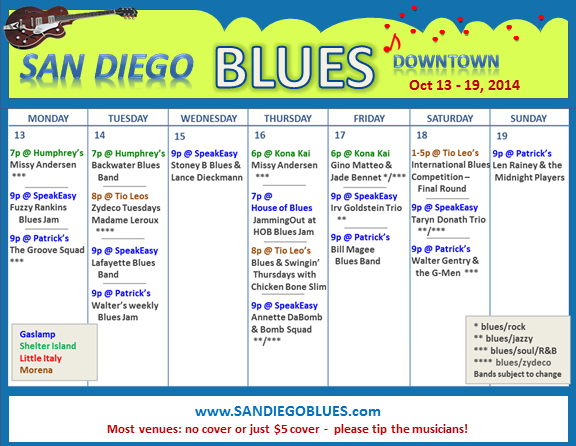 This is a light week for San Diego blues, but you will still find some good live blues every single night in the Gaslamp. There is also Saturday afternoons at Hennessey’s! I’m sad to see that Patrick’s Pub is shifting to more rock and Humphrey’s Backstage has less blues, but Kona Kai’s lounge will be re-opening in July. Every Wednesday night, “JammingOut at HOB” hosts a blues jam that has developed a wonderful following in its first year, and this past Wednesday they celebrated their 1st anniversary downstairs at the House of Blues. It was a fun evening, and here are some videos I got – the lighting wasn’t great so its a bit dark and grainy, but most of it is good. Here is Dona Aguinaldo, one of a number of wonderful female vocalists that night, who got up to sing Etta James’ cover At Last. Wow! I just wish the lighting had been better… On stage with her (and doing their own jamming solos) is Bob Sortillon (standing next to her) and Rich Giglio on guitars, Tom Safreed on harmonica, Dave Lindgren on bass, and Steve Douglas on drums. Bob, Rick and Dave also each sang some great songs, but the videos didn’t turn out. Then Christine Gilardi performed Bonnie Rait’s cover song Love Me Like a Man. She rocks it with Somerset Barnard on guitar, Tom Safreed on harmonica, Yasha Susoeff on sax, Victor Franklin on bass and Michael Minor on drums. Afterwards Victoria Wasserman got up with them and nailed it with that so familiar BB King (amongst others) cover song Stormy Monday. Somerset Barnard, visiting from Brisbane Australia for a few weeks, got us up and dancing to another favorite, Got My Mojo Working. And to end the evening we had Len Rainey, a favorite local bluesman, take the stage and sing, as only Len can do it, the cover song Kiddio. He’s joined by Doyle Thomas on guitar, Kevin Cooper on keyboards, Michael Minor on drums, David Lewis on harps – as well as Steve Lang. Again the video is a bit dark, even after lightening it up as much as I could. The final song brought Lafayette Falkquay on the stage to join Len on bass, and they had a fun exchange as they performed Slow Down Baby together. I only captured a bit of the evening. We also had a number of brass players (more sax, trumpet and trombone), and other performers who made it a special anniversary evening. Next week the jam is back upstairs, but it starts 2 hours later at 9pm (for just this week). Last night at Walter Gentry’s Chicken Wings blues jam at Patrick’s, we had a house full of brass (sax, trumpet and trombone). In this video, visiting Australian Somerset Barnard is playing guitar and singing a Mojo Webb (another Australian bluesman) tune called Hands Like Mine. The vocal sound quality isn’t that great, but the rest is really good and catches solos from everyone on stage. Along with Somerset is Leonard Lee on guitar, Bert Hammer (visiting from Canada) on drums, Gary Stutts on bass, Steve Lang on harmonica, Chuck Arcilla on sax, Carlos Serrano on trumpet, Phil Lozano on trombone, and also on sax – a 21 year old I’m waiting to get the name of, who was amazing. This is an interesting blues week. Most of the bands that are scheduled are not fully blues, but more soul, R&B, zydeco, country and pop. 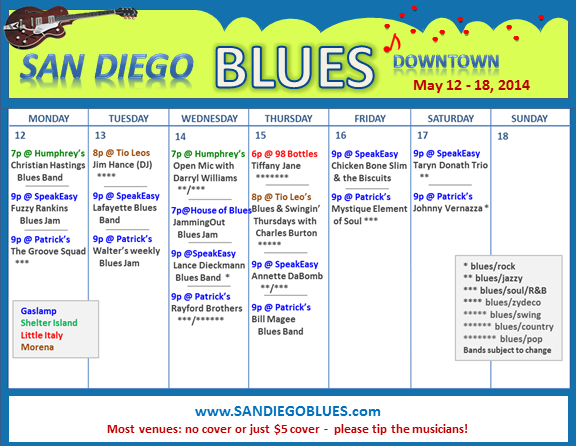 The jams will have the most straight up blues, with the exception of Christian Hastings (Mon), Lafayette (Tues) and Bill Magee’s band (Thurs) – they are all blues! 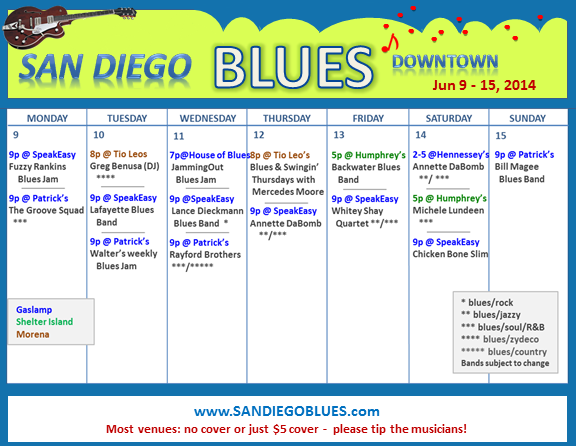 Wednesday is becoming jam night, with open mic at House of Blues, Humphrey’s and out at Proud Mary’s (in Kearney Mesa). And of course there is Walter’s jam on Tuesday and Fuzzy’s jam on Monday. The JammingOut/BLUSD jam at House of Blues will be held downstairs this week in the Delta Room to celebrate their 1st year anniversary. I’ll be there for sure! This coming weekend is the 3-day Gator by the Bay (Spanish Landing Park – across from the airport on Harbor Drive) event, featuring blues and zydeco music. For more details and the huge lineup of bands, check out www.gatorbythebay.com. 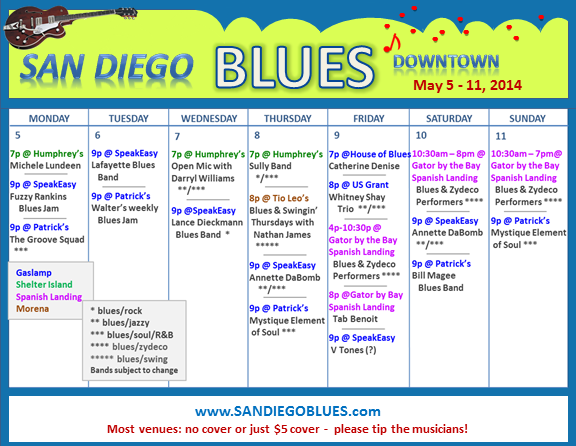 Humphries seems to have shifted its calendar (at least for this month) to blues on Mondays, R&B on Thursdays and open mic R&B/soul/gospel/jazz/blues on Wednesdays. Kona Kai (also on Shelter Island) is undergoing extensive renovations, so there is less blues on the island right now. Patrick’s Pub is adding more rock to the schedule, which means fewer nights of blues on our calendar. Yet House of Blues seems to be adding more nights of blues, and this week Catherine Denise out of Antonio, TX will be here with her award-winning blues playing. Speaking of House of Blues… there is no Wednesday night jam this week. But there is the 88.3 Jazz blues jam that night from 6:30-9 at Proud Mary’s (up in Kearney Mesa), which used to be in Little Italy. LaMonte DeMille is back in town with his Chicago Blues after being away this past year. He was at Humphrey’s Backstage this weekend with his band, which includes many familiar faces in our blues scene (Walter Gentry on sax, Victor Franklin on bass and Ernie Ferrel on trumpet). I know lots of blues lovers also enjoy jazz, and I’m one of them. While I don’t cover jazz on this site, Whitney Shay is part of our jazzy blues scene downtown, and she kicked off the 88.3 Jazz Summertime series at the Westgate hotel on Friday night. The next event will be on June 6th. Here’s Whitney and the JazzKats performing Boogie Woogie Bugle Boy on the Riviera Terrace of the hotel. Whitey Shay is delightful. Enjoy as I did!